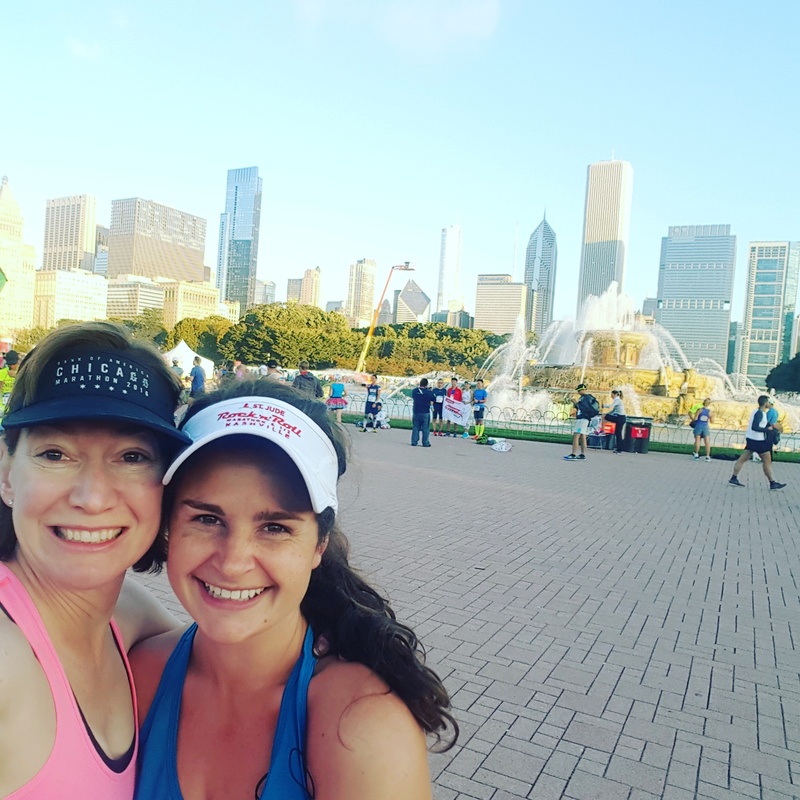 Like the studious gal that I am, I had read about post-marathon recovery in order to avoid the pitfalls that had befallen many a runner before me. However, much like the race itself, reading is not the same as experiencing it. Here are a few of my most unexpected findings. 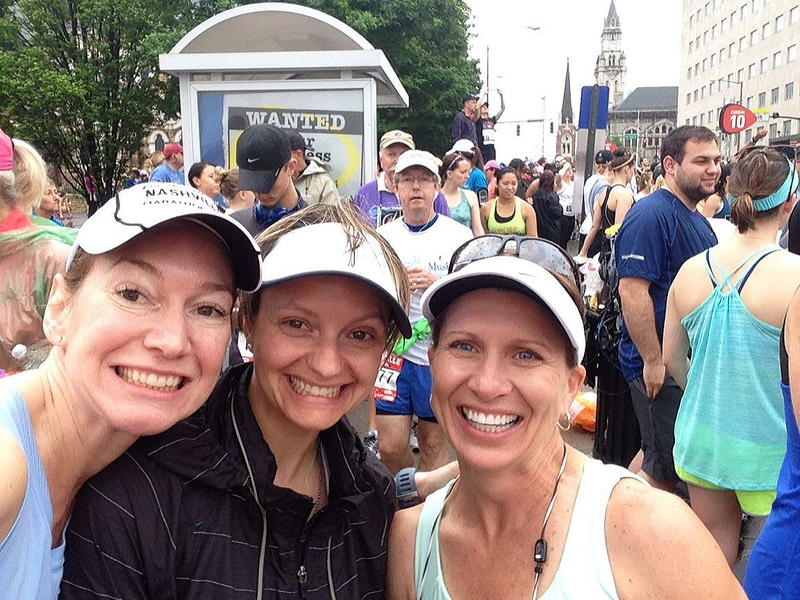 I had read about post marathon depression, but much like R.O.U.S.’s, I doubted its existence. 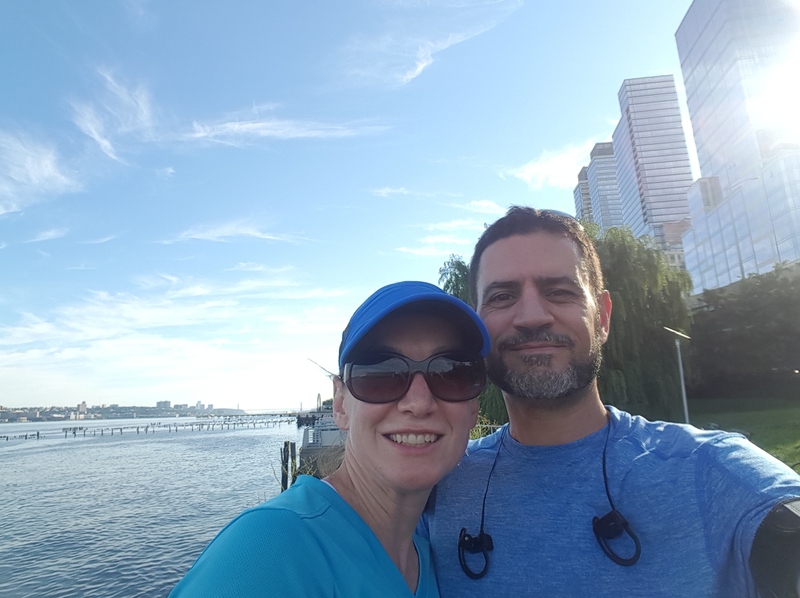 “Depression” is too strong a word, perhaps the “post marathon blues’ would be a better description, but whatever you call it, I was surprised to find that I did not feel like myself for the next weeks after the race. 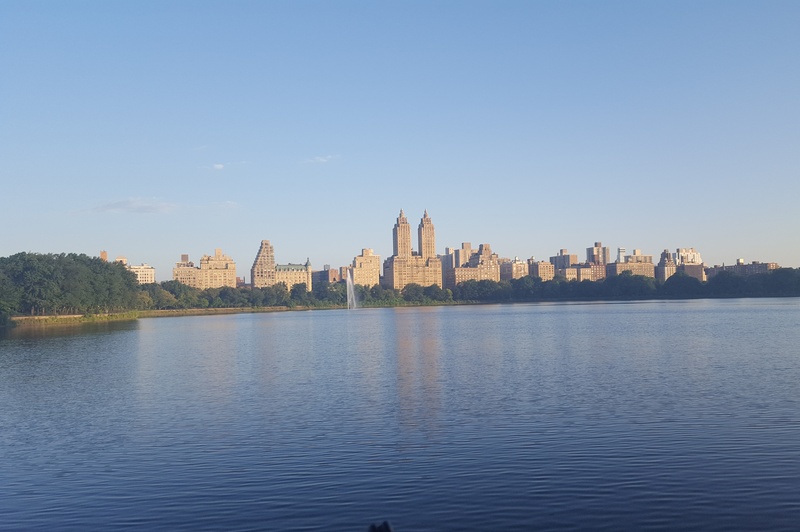 Perhaps it was the carb withdrawal (no more carrying around a bag of bagels) or maybe the lack of long run endorphins, but I felt more moody and irritable than normal. It may simply have been the normal let down after such a highly anticipated event. Luckily, I felt back to normal in a couple weeks. 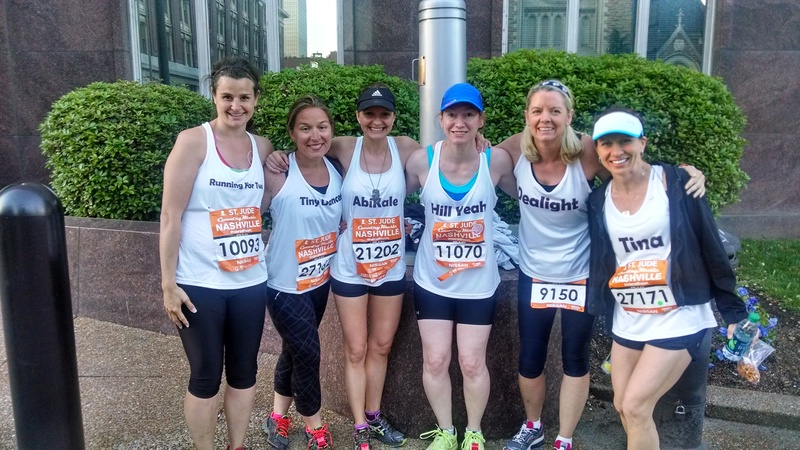 While the race itself was entirely harder than imagined, the physical recovery was not so bad. 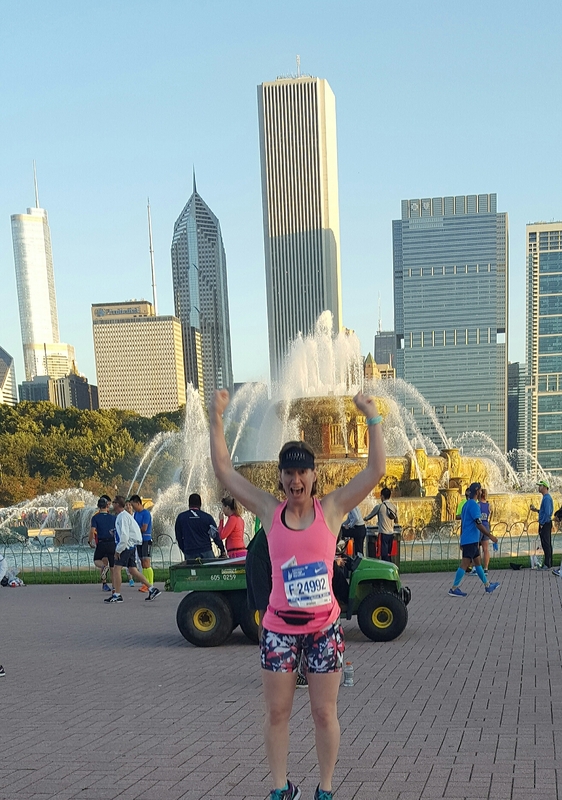 Many had warned me “that I wouldn’t be able to walk for a week” after the race. While I was sore, I was back to regular activity the next day. 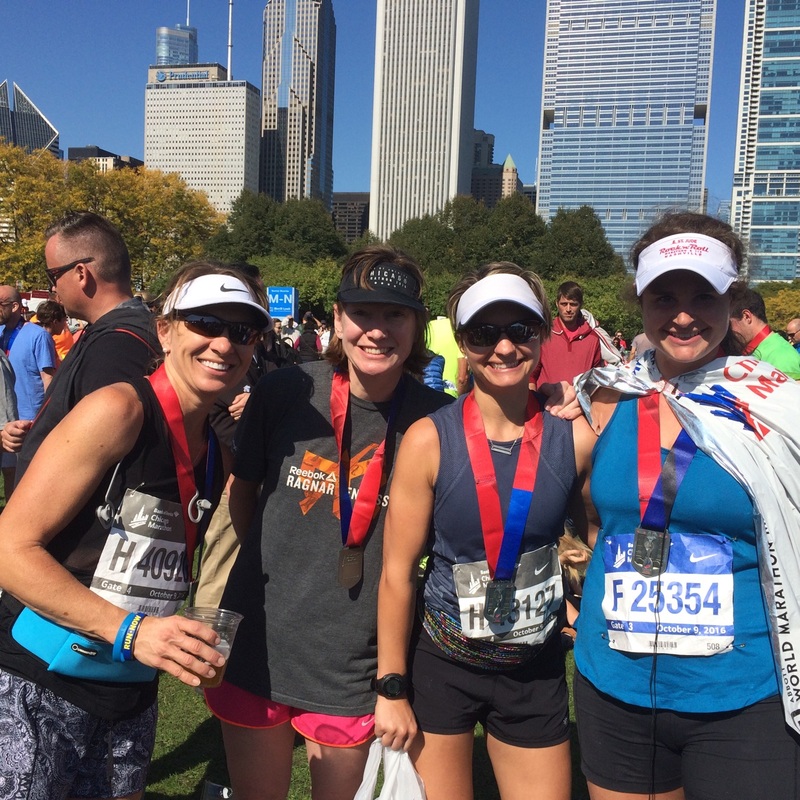 I followed the a post marathon taper I found in Runner’s World and it worked well. 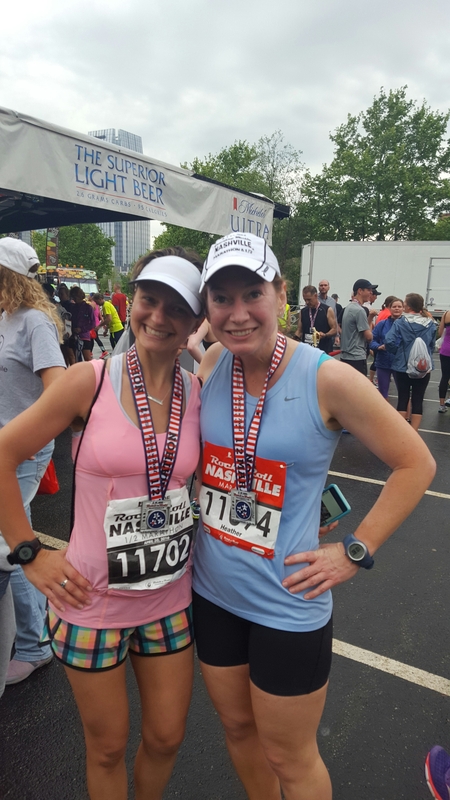 I’d heard many people say that their marathon experience really burned them out on running in general and especially marathoning. 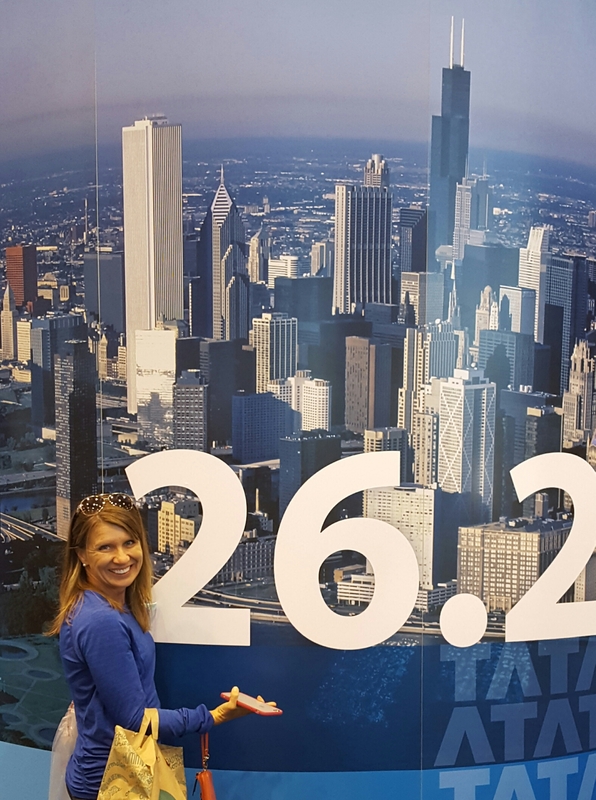 Even though my experience wasn’t perfect (and maybe because it wasn’t) I definitely want to give my legs another chance to try 26.2. Not this year, the timing won’t work, but perhaps next fall, I’ll try the monster again. I made it through the race with no major chafing or blisters, but about a month after the race, one of my toenails decided to pop off. It never turned black, it simple wiggled out like a lose tooth. No pain or drama was involved. I’m a “real” runner now! While the race didn’t ruin me for running, It was nice to run/walk/swim/crossfit without checking boxes or worrying about pace. While I’m still too type A to be all ‘wild and crazy’ and run without my Garmin, I’m not absorbed with mileage this summer. I’ve even slept in here and there and eaten pancakes with kids. While the race itself was a stinker, other than feeling a little moody and losing a small, expendable piece of my toe, my recovery was rather harmless. Of all the many things I stressed over about the race, the recovery should not have been one of them. 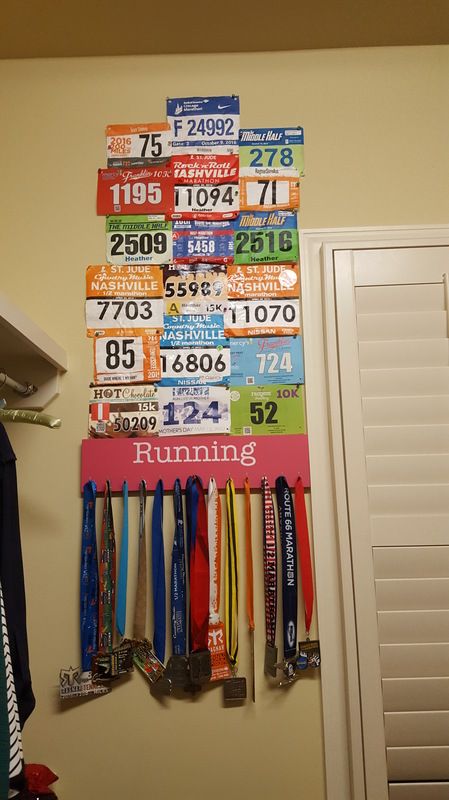 This entry was posted in Running and tagged country music marathon, crossfit, marathon training, Running on July 13, 2014 by drrupe. At mile 23 the dude from Cake blasted through my earbuds, telling me to keep going. Mentally and physically exhausted, I was in desperate need of this stupid race to be done. As I attempted to summon the will power to make it the last few miles, a stabbing pain sliced through my right knee. Having never had knee issues in my entire life, I was flabbergasted. My thoughts quickly turned from confused to horrified, as the pain intensified to the point I could no longer run and just barely walk. “Not now. Not so close to the end.” I thought. 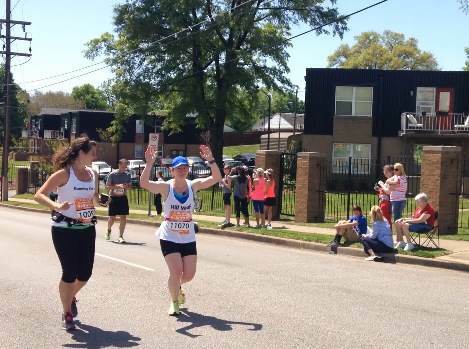 “Lord please let me finish my first marathon.” I prayed over and over. The tears of pain and frustration poured down my cheek as I hobbled along. But perhaps I’m getting ahead of myself. Let’s start from the beginning…. Ever since that debacle that was the Hot Chocolate Expo, I have been anxiously awaiting the marathon expo. 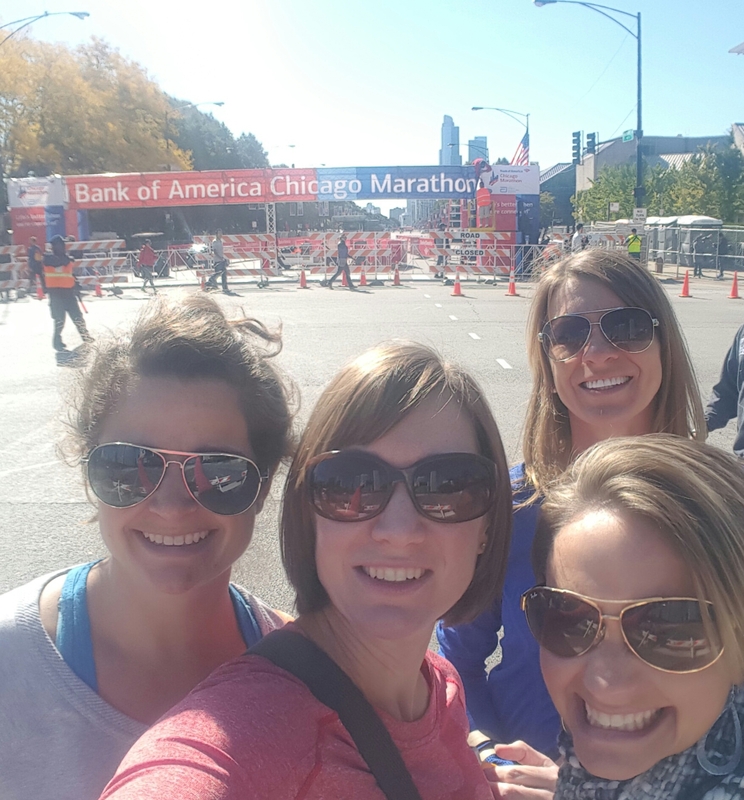 I pictured spending the morning with my friends slowly perusing the various vendors, stocking up on GU and buying the perfect 26.2 t-shirt. Things didn’t go quite as planned. I did get to meet my buds for lunch, so I went solo to the expo. Even pressed for time there was ONE priority: The VIP Potty Pass. 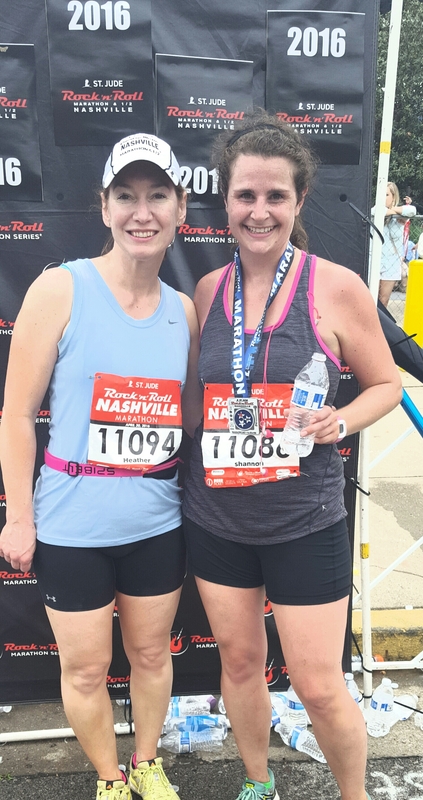 Last year when I ran the Music City Half, despite being over an hour early to the race, the porta potty lines where too long for my excellently hydrated self to get bladder relief before the race. This year I was determined to start more comfortably. If you buy $150 of Brooks merchandise at the Expo you get the VIP Potty Pass which guarantees no lines and a REAL toilet and sink. I bought an extra pair of shoes (that I will use eventually) and a souvenir hat and I was good to go. Literally. 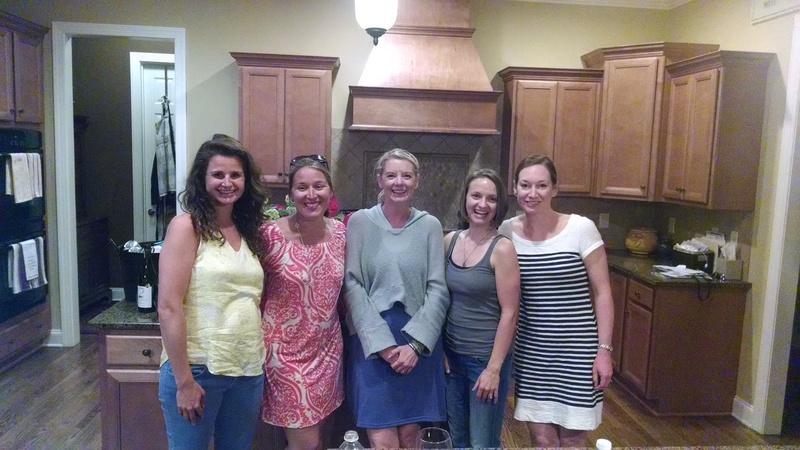 The night before the race we carb loaded at Abby’s house with pasta and sweet potatoes. It was the perfect evening to sit on the deck with our friends and husbands, nervously discussing the next morning. Abby likened the excitement and butterflies to getting ready for the prom. The six of us had spent the last 4 months logging mile after mile together, now the big day was nearly here. Actually Nancy, no it wasn’t. The big worry was Christina. Struggling with a stomach bug, she hadn’t been able to eat all week. She promised that she was taking fluids, but she hadn’t been able to carb load and she missed the night before party so she could rest. We fretted that she wouldn’t make the race or worse, that she would stubbornly push herself too far and get injured. Our next fear was the heat. The forecast was projecting temps in the 70’s. 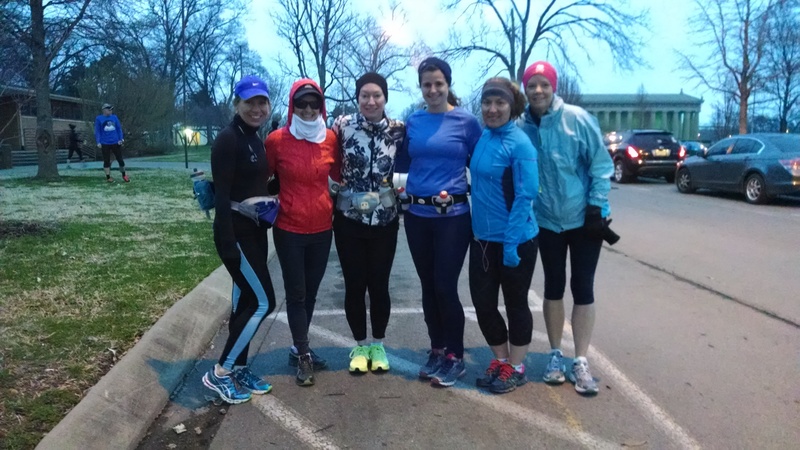 We hadn’t run in any weather hotter than 40, with most of our runs in the teens. We were used to frozen bums not heat stroke. Christina rallied in the morning and decided to attempt the race. She promised not to push herself, but we were still worried. We arrived downtown an hour early, getting dropped off on the far end of Broadway turned out to be perfect. The was no traffic and no line at the porta potties near corral 30. But did I use the empty porta potty? No. I pridefully went in search of my “fancy” porta potty. Once I got to the starting line, I discovered where the other 30,000 people were hanging out. I began desperately searching through the crowds for the VIP bathrooms and couldn’t find them anywhere. 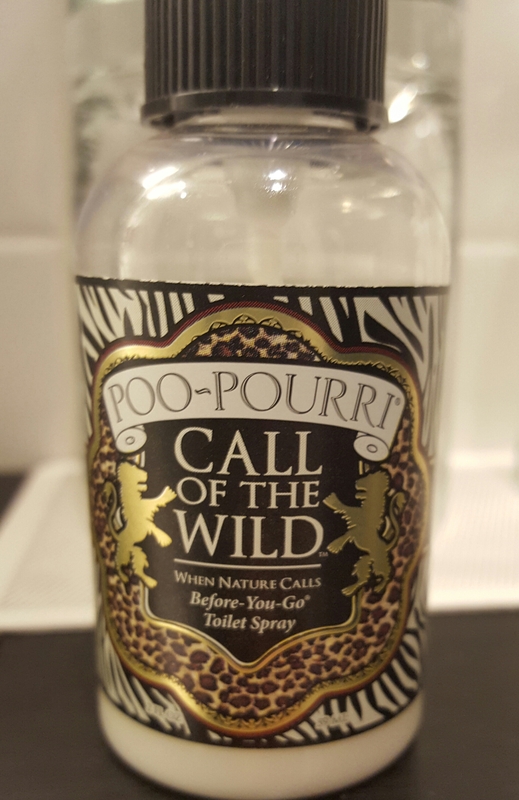 As my bladder approached its capacity, my panic escalated. All the bathroom lines near the start were at least 50 people long. After being sent on 3 wild goose chases, I finally discovered the VIP bathrooms had been moved to the convention center. I barely had time to meet up with Shannon and get back to my corral. The wait in the corral felt like an eternity. With 30,000 people running it took 20 minutes for me to cross the starting line. Shannon was running the half and she paced with me the first 11 miles. I was a nervous mess. I couldn’t believe the big day was really here. 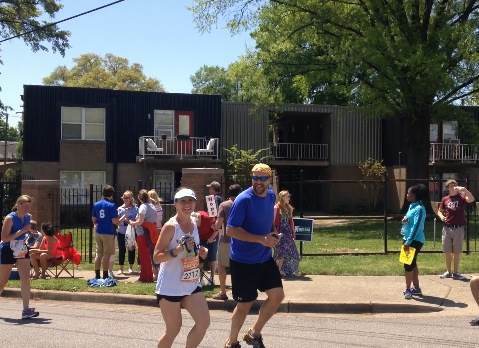 Minutes before I crossed the start, I got a well meaning text from husband wishing me luck and telling me not to worry that the weather would be a “perfect 75 degrees” at the end of the race. I got a sinking sensation in my stomach. 50 degrees is perfect race weather, 75 is borderline dangerous. I made up my mind to drink at every water stop and stay on pace. 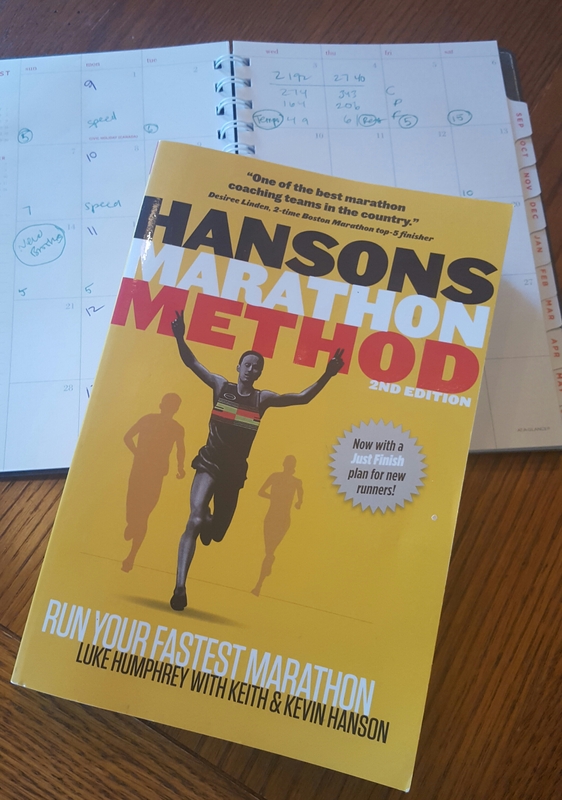 Hal (Higdon- the author of the Marathon Book I read, who I like refer to in first person as if he’s my BFF) told me not to set a time goal for my first marathon other than to finish. My last half was a PR of 1:47. I felt strong and well prepared, so I proudly thought that I could manage a sub 4 hour marathon. In hindsight I wish I could go back to that starting line and slap some sense into my silly overconfident self. But alas, I set out with a goal pace of 9:20 min/miles stubbornly ignoring Hal’s advice. We crossed the starting line at 7:20 am. The crowd of runners was thick. The first several miles were spent jockeying for position and laughing at all the spectators signs. The excitement was tangible. 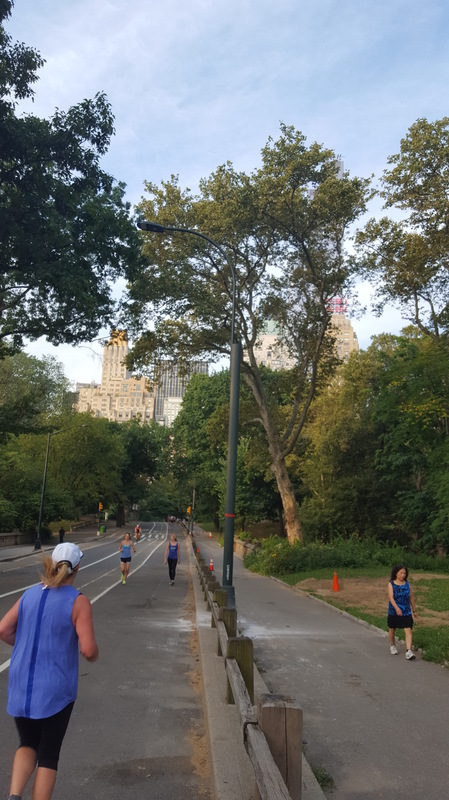 I tried to pick a comfortable pace but every time I checked my Garmin it was off due to the buildings. Even though I felt comfortable I started too fast with several mile splits under 9 min/miles. 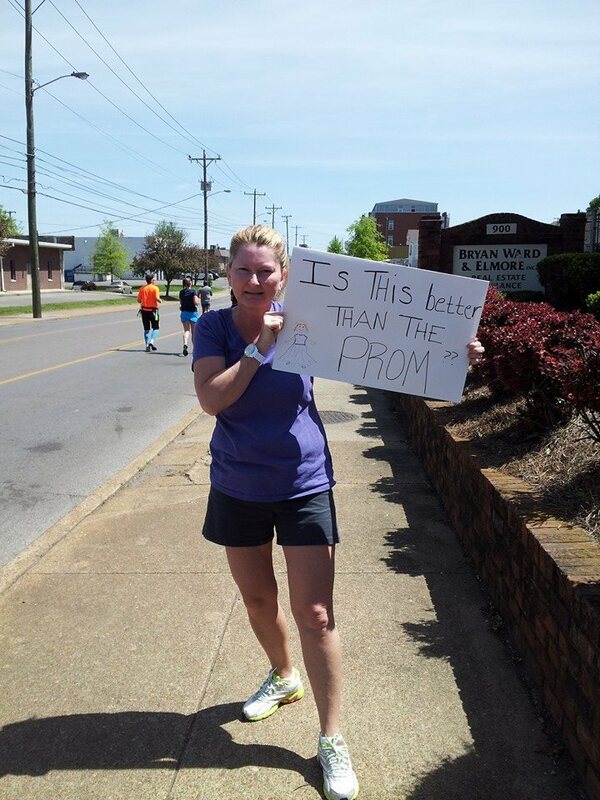 My sister Amber cheered me on from OK by posting hilarious running signs to my facebook. Running through the tunnel under the Music City Center was awesome. I felt like a kid waiting in line for an indoor roller coaster with the echoing footsteps and flashing lights. 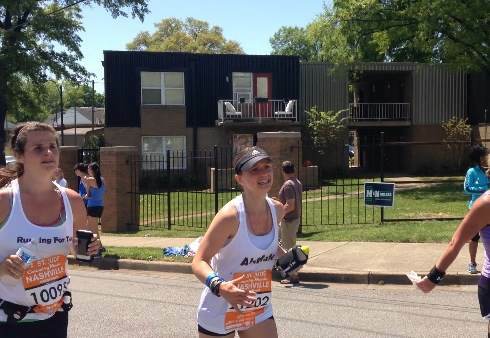 We ran though the familiar landscape of music row and Belmont, on an adrenaline high. Shannon and I were having a blast. 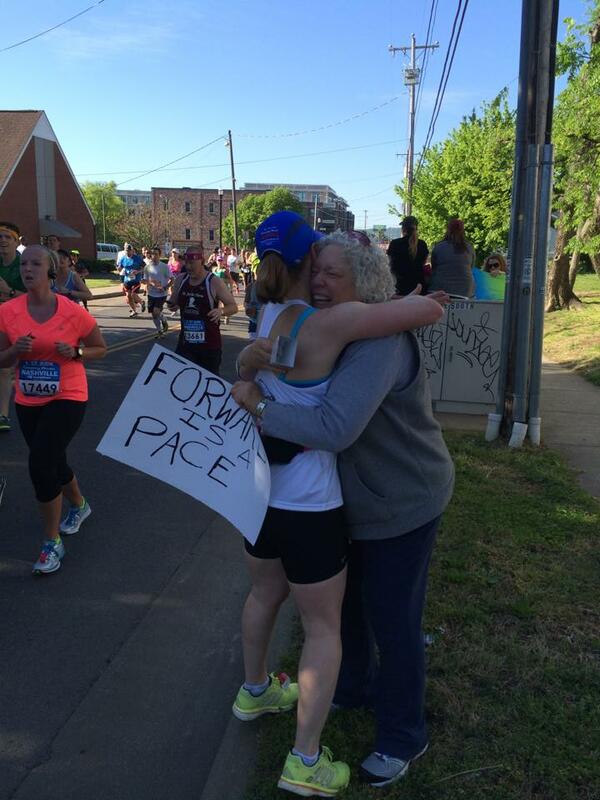 At mile 7, I saw some friends who were cheered me on and gave me a good luck hug. 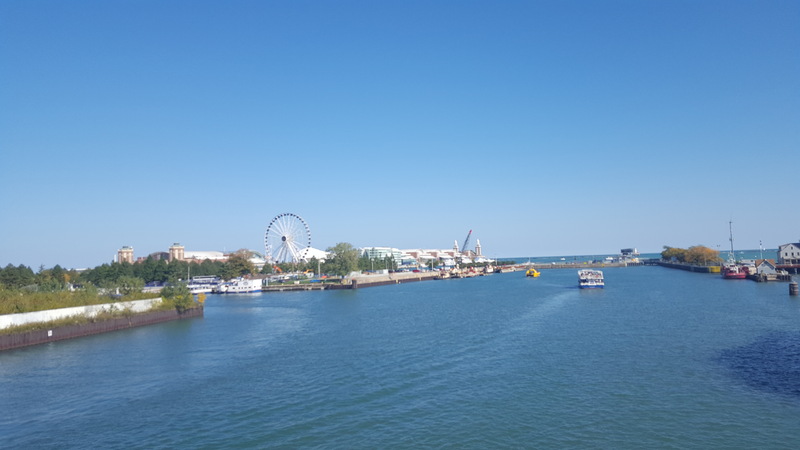 Then with a lump in my throat, for the first time in my life, I went straight at Bicentennial Park instead of veering right. The crowd of runners thinned significantly. This was definitely the road less traveled. 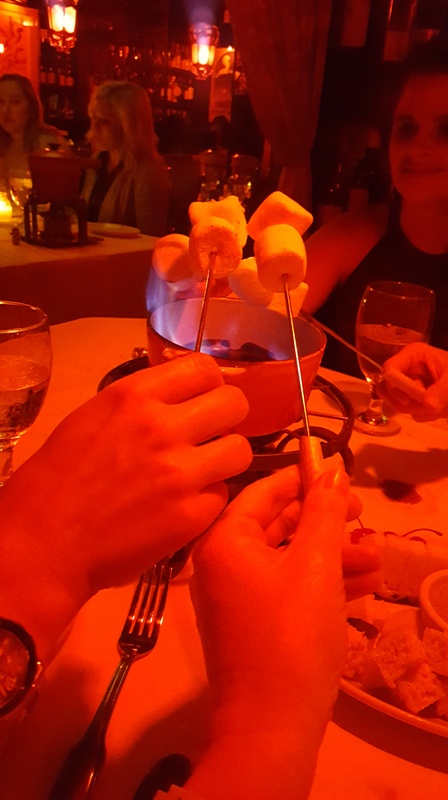 Soon after the split, the heat began to get to me. 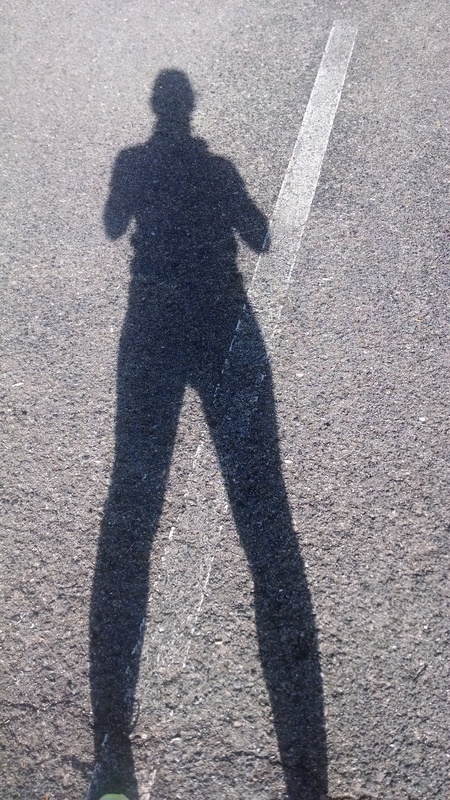 Having not run any of my training runs in weather over 40 degrees, the sun felt oppressive. One extremely smart thing I did along the way was stop at the medical tent and get sunscreen, otherwise my pasty self would have been a lobster for the entire week. Once I was on my own I pulled my ipod out of my belt. I don’t usually listen to music while I run, but I figured I could use all the help I could get at this point. As we headed out Rosa Parks Blvd, it got desolate: no fans, no bands, merely heat and buildings. It was a nice long down hill slope. About half way down the slope it dawned on me that this was an out and back, meaning I would have to run back up this hill. Crap. I had hit my half way split at 2:04 so I was already realizing that I wouldn’t get a sub-4 and began to get down over that. 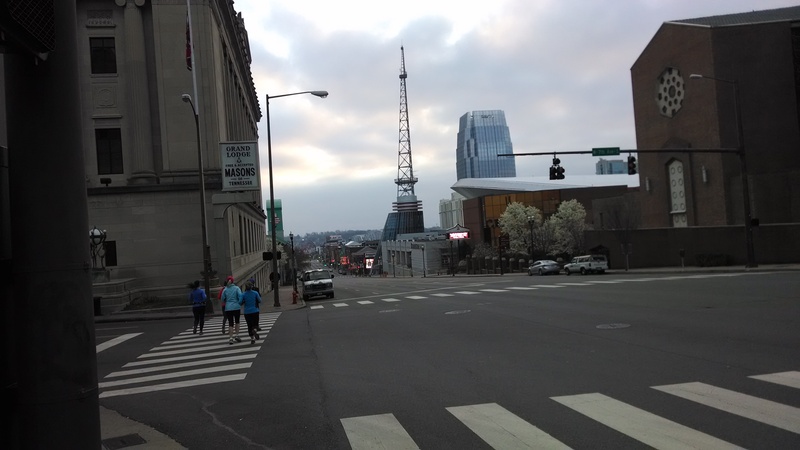 I made it back up the the Rosa Parks hill and ran briefly back through downtown. We ran beside the half runners again, those lucky devils were almost done. I hated them all. At this point I noticed a lot of my fellow marathoners starting to walk up the hills. I have always “attacked the hills”. My new mental strategy at this point was to start counting “hill kills” (the number of people I passed going up the hills). I stopped worrying about my time, my new focus was finishing. Mile 18 is when the migrating pains started. A different part of my body would hurt for about a quarter of a mile. My pace dropped of to 10:15 and I began to fantasize about walking. My hill kills were over a hundred at this point and it seemed too hard to keep counting. As we ran up the hill into East Nashville I was gleeful to see a water stop half way up the hill (I let myself walk through the water stops to make sure I drank enough). I begin to have moments of panic. I had not expected to feel this tired so early. I began to worry about Christina, hoping she was OK.
My Dad, Step mom and oldest son greeted me around the next turn. The water and encouragement they gave me helped me through the next few miles. 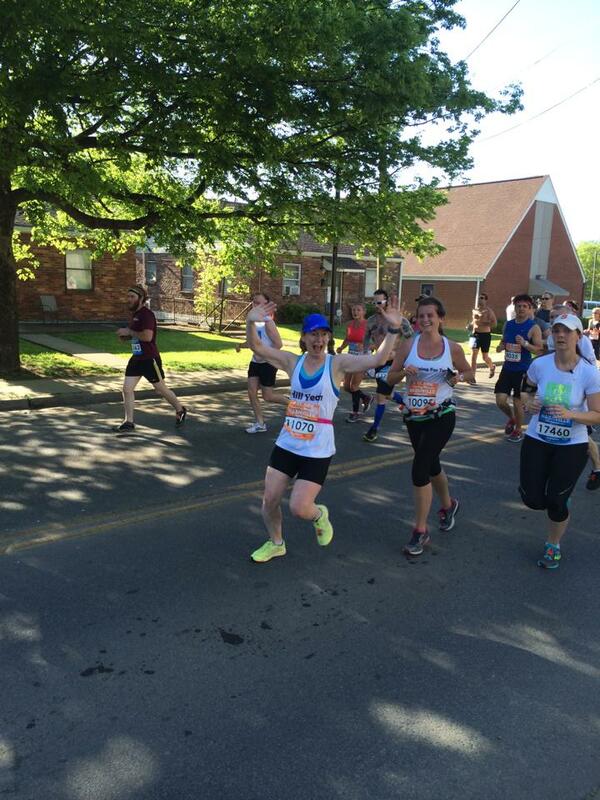 They found me again at mile 22 and 24, cheering me on to the finish. The last hour was torture. 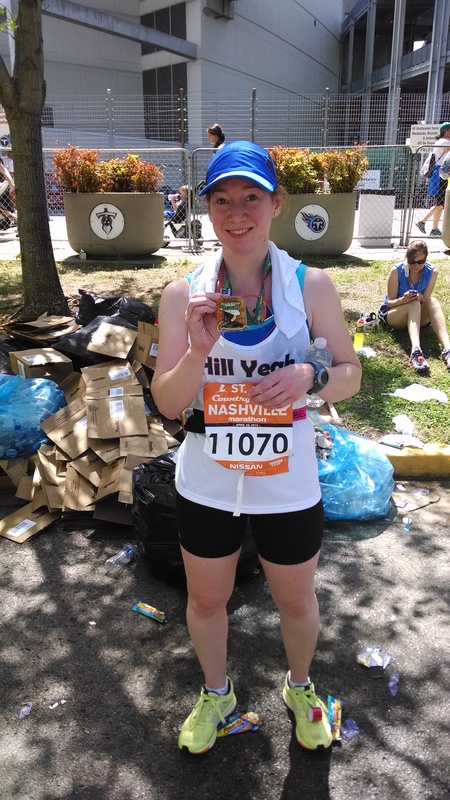 The heat was sweltering, my legs were shot and I just needed it to be over. I realized I had made the obvious rookie mistake of starting out too fast. 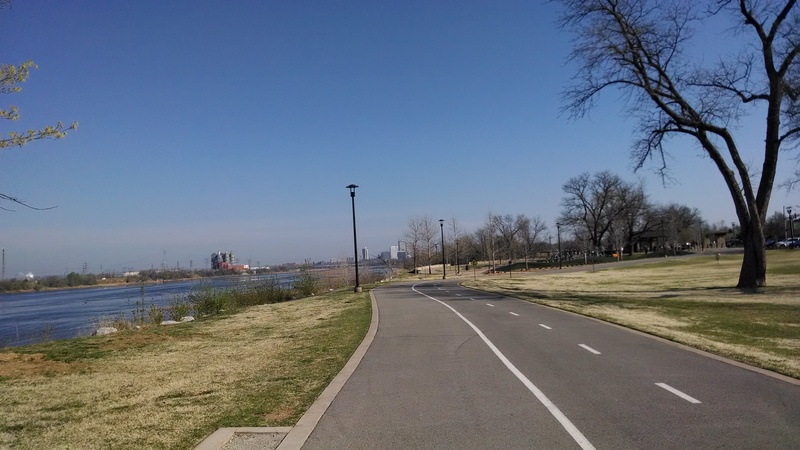 As we entered the uneven terrain of Shelby Bottoms, it took every bit of will power I had to keep moving. 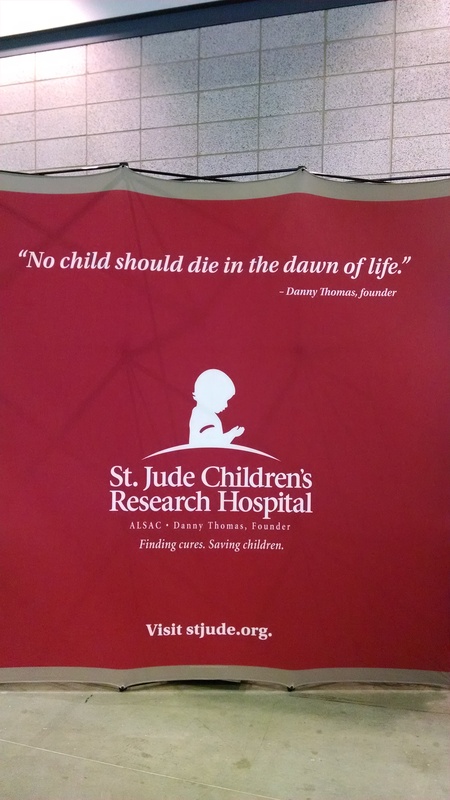 I keep thinking of the kids at St. Jude, particularly my cousin Brittany who was treated for leukemia there. She was my inspiration that last hour. “Not now. Not so close to the end.” I thought. “Lord please let me finish” I prayed over and over. The tears of pain and frustration poured down my cheek as I hobbled along. I was prepared for muscles cramps, “the wall” and even pooping my pants. I was not prepared for injury. What if I don’t finish? What if they have to call the ambulance? What would that cost? Will I meet my deductible? What if I need knee surgery? Crap, that means I’ll miss work. Everyone will be really mad at me. My husband will never let me do this again. That simple advice pulled me back to reality and I kept going. 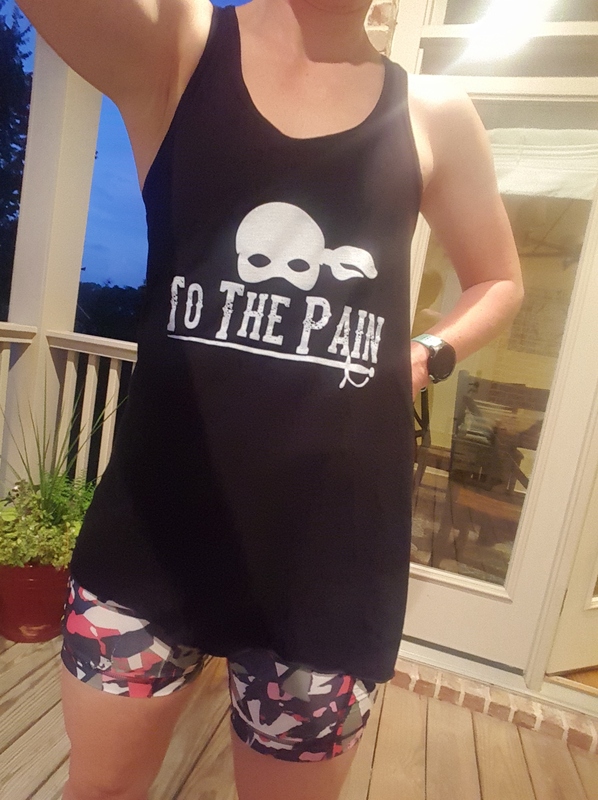 After about half a mile the pain magically went away and I was able to run again. I was going slow, but I knew I would finish. Then it was over. We crossed the finish line at 4:24. I had pictured my self feeling euphoric in this moment, but instead I merely felt relief that it was done. I laid in the shade and drank water until my parents found me to take me home. 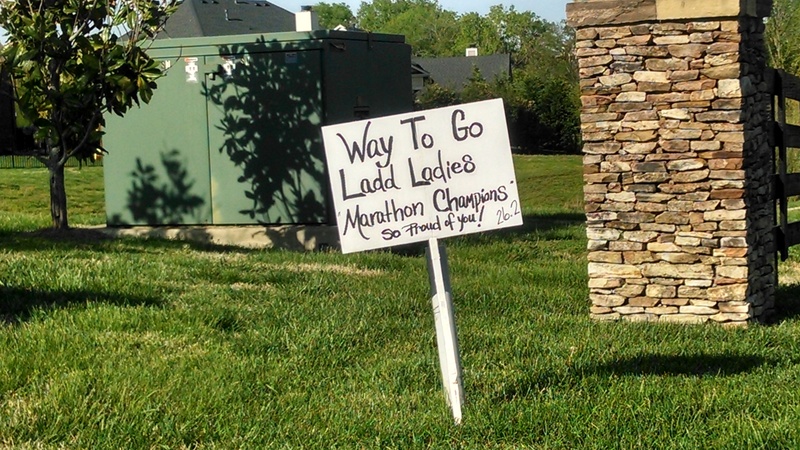 As we pulled into the neighborhood, this sign made me misty eyed. 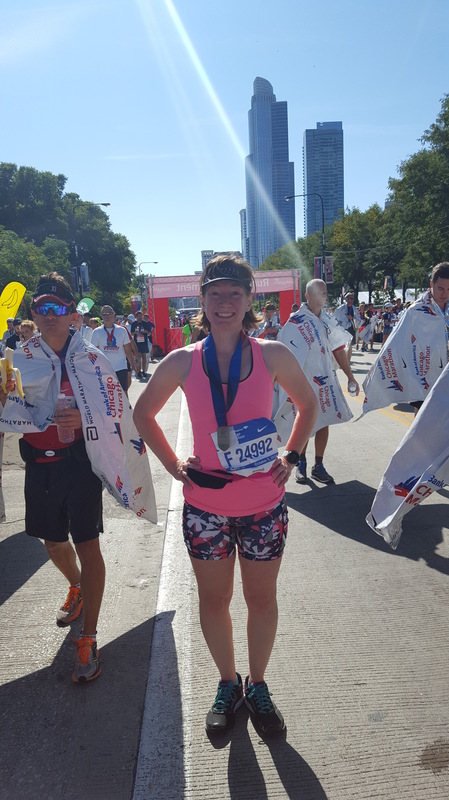 Running a marathon was the single hardest physical thing I have ever done. 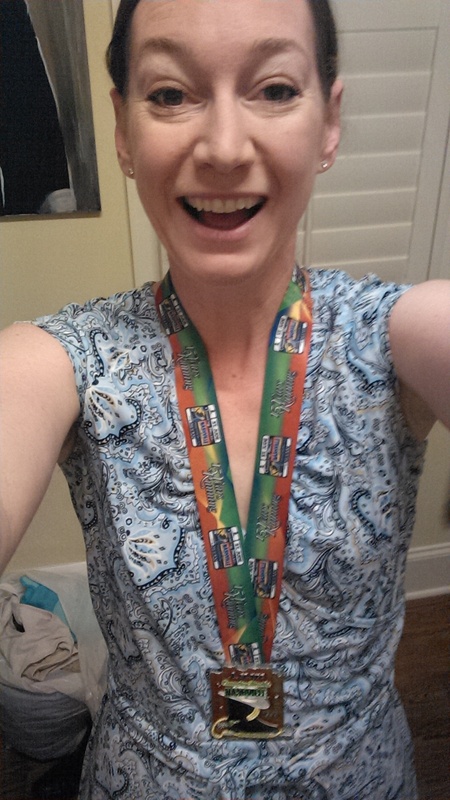 Perhaps picking a hilly course on a hot day is not the ideal first race, but nevertheless I ran 26.2 damn miles. 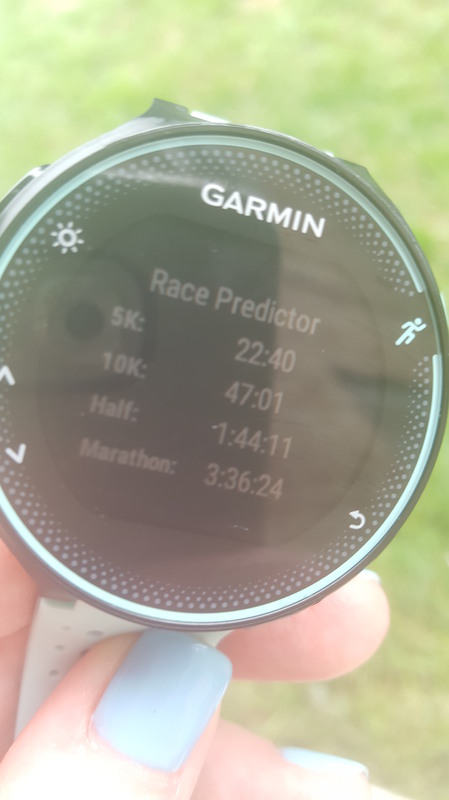 Actually my Garmin read 26.7, but who’s counting. “So how was your race?” My staff asked me as I walked into the office on Monday morning. 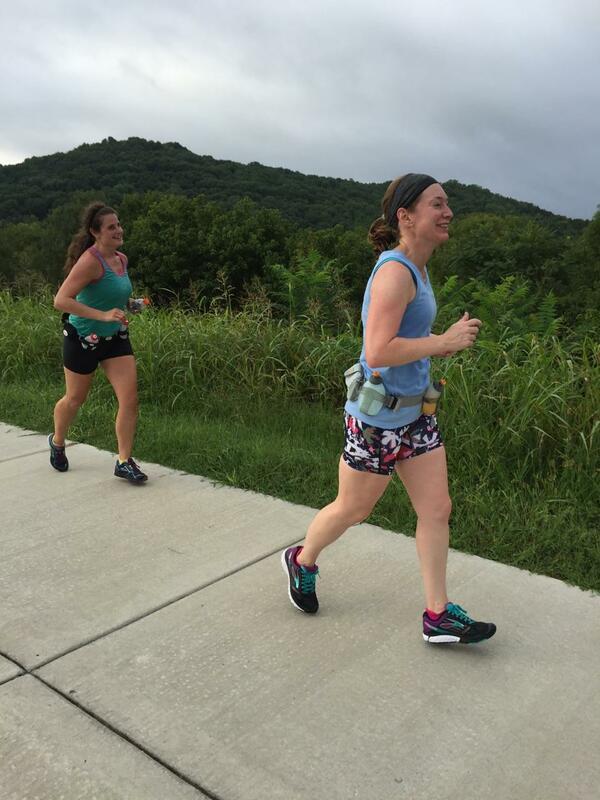 This entry was posted in Running, Uncategorized and tagged country music marathon, marathon training on May 4, 2014 by drrupe. 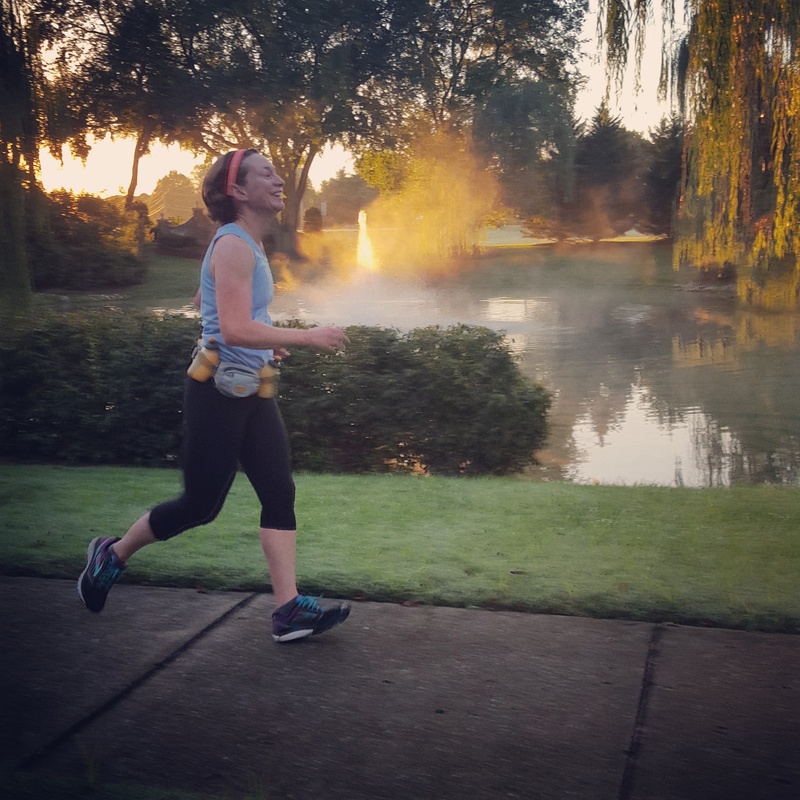 One week from today, I will run my first marathon. Four months of training, blisters, sore muscles, frozen hair and laughs will hopefully all pay off on April 26th. I can’t wait to cross that finish line. Life has been busy and since this little blogging project is a sub-hobby of a hobby it must take a back burner to more important things, such as the 10 babies I delivered in the last week and coloring Easter eggs with my littles. But alas I wanted to document my last few long runs, for posterity’s sake in case I never do this again. I ran 18 by myself. To make the distance slightly more palatable I broke it up into smaller chunks. I started in Sullivan Farms and ran 3 out and back into Ellington Parkway. Then I stopped back at my car, dropped off my headlamp (I had to start at 5:30) and picked up my iPod and fuel belt. I don’t normally run with music, but with 18 miles alone I needed a little help. I hate ear buds, so I ran with my 1985 walkman earphones. I looked ridiculous, but Katy Perry helped me through those last miserable miles. 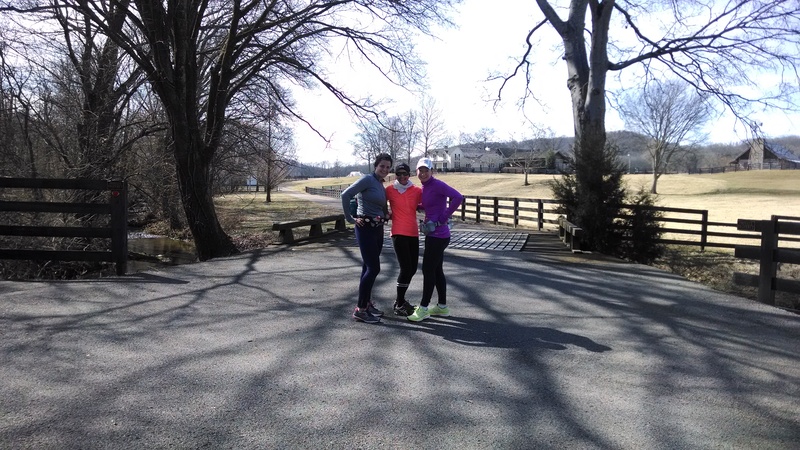 I then ran through Polk Place, up Lewisburg Pike and through the Carnton Plantation. Running past a Civil War Cemetery at sunrise was phenomenal. Twenty miles was the longest run of our training. 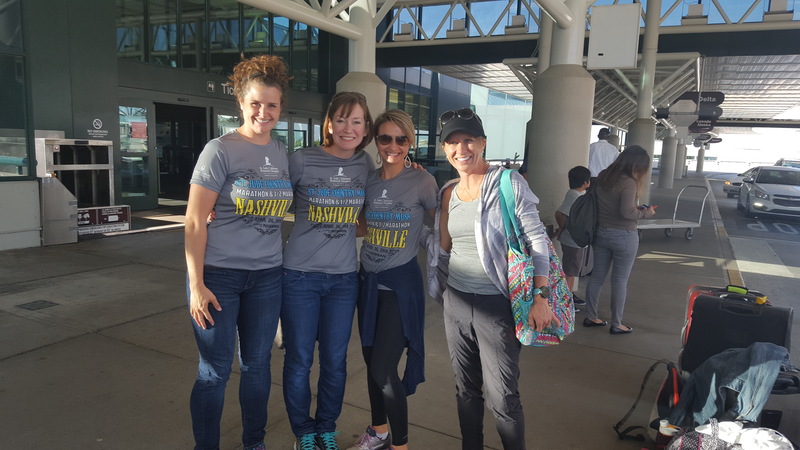 The idea was pretty daunting so once again we teamed up with Nashville Striders who organized the course. 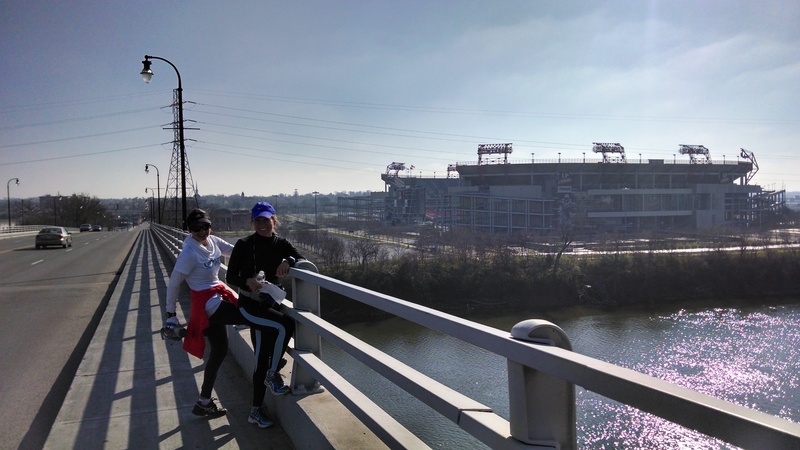 We ran from Centennial Park to LP field and back, running most of the first half of the course. It was one of the only runs where all 6 of us got to run together. Twenty miles was a challenging distance, but once again our legs took us further than we thought they could. Tulsa is my hometown, where I started running. 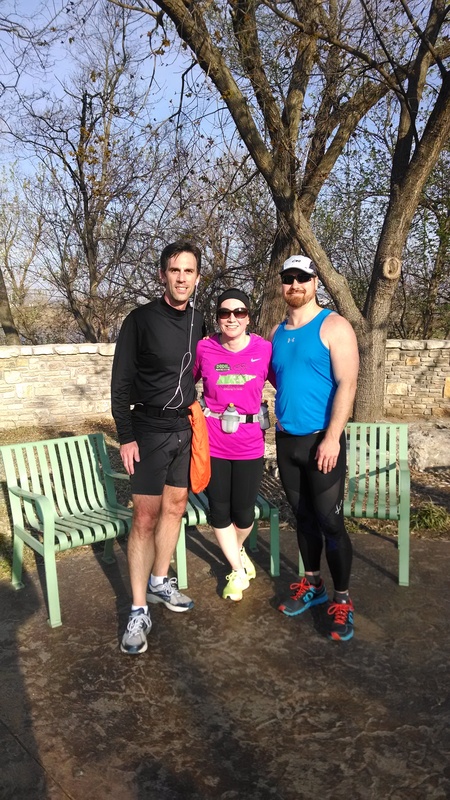 Running in Tulsa is wonderfully nostalgic for me, so when I realized I would be traveling home for a wedding a month before the race I was tickled to get to a run a long run on the River Trails in Tulsa. 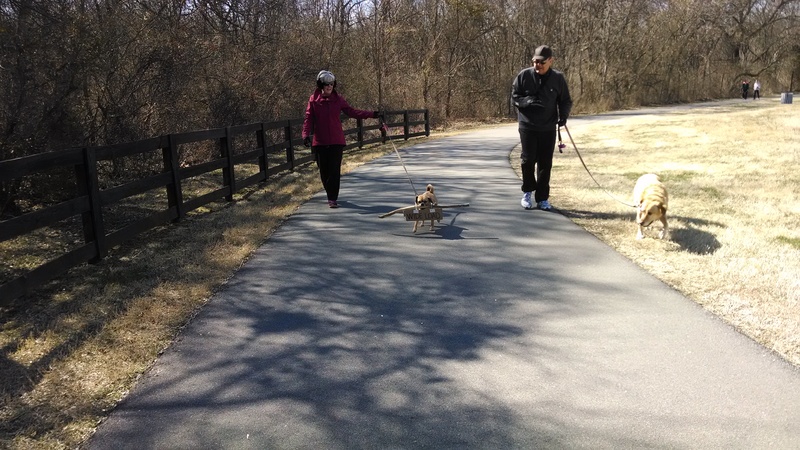 With over 20 miles of beautifully maintained trails with regular water stops and bathrooms and a separate trail for bikers, its is the perfect city for runners and bikers. I got to catch up with some old friends and literally take a run down memory lane. I am truly jealous of the park system in Tulsa. I was on such a running high after my 16 miles there I came back to my parents house and declared that we we’re moving back to Tulsa. However, my bubble was then burst when my husband informed me that this would involve us having a long distance relationship. For the next week I’ll carb load, neurotically check the weather and hopefully get some sleep. The weather forecast is looking hot,which makes me nervous, since we have only been training in cold weather. 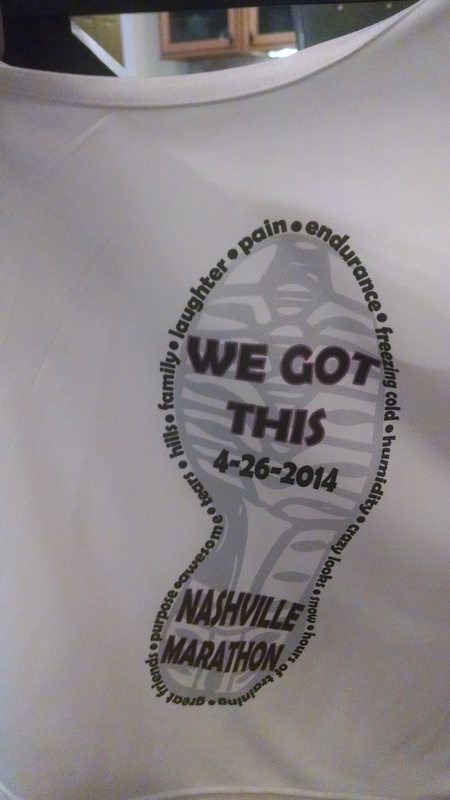 At least our matching t-shirts for the race are short sleeves. If you see us on the course next week, wish us luck! Anyone have any advice for us first timers? 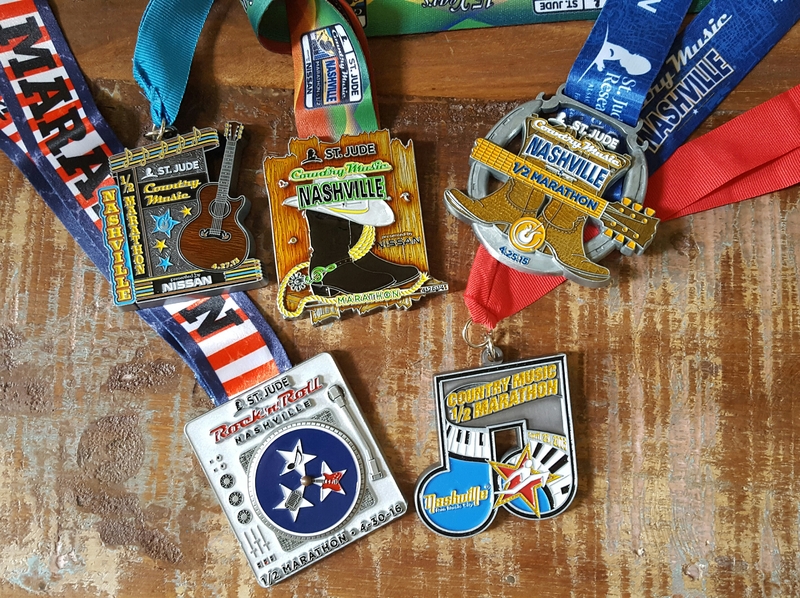 This entry was posted in Running, Uncategorized and tagged c, country music marathon, marathon training, Nashville Striders on April 20, 2014 by drrupe. Last week I ran a total of 36 miles. I’ve been dreading March since I started training. The mid week runs are 5-8-5 miles. That means that now my mid week tempo run of 8 miles is longer that my first “long run”. 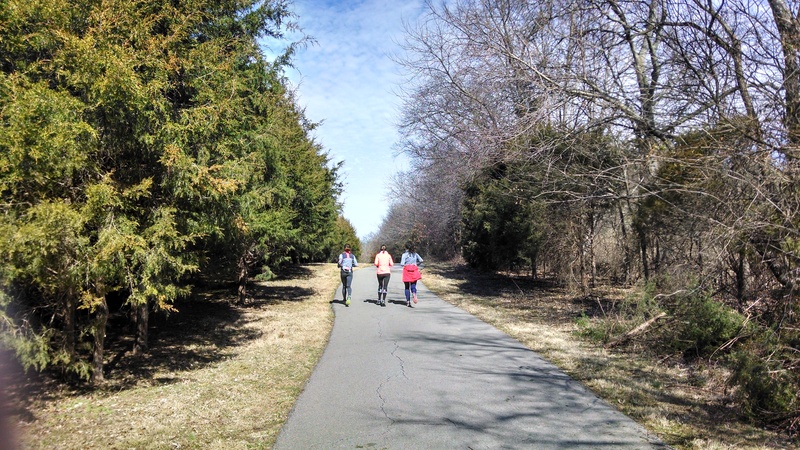 The long runs themselves are stretching to obnoxious lengths of 17-20 miles through the month. Of course the highest mileage week of our training also fell on a challenging week for me personally and a hectic week at work. I knew this would happen at some point in my training. It did and I made it through. 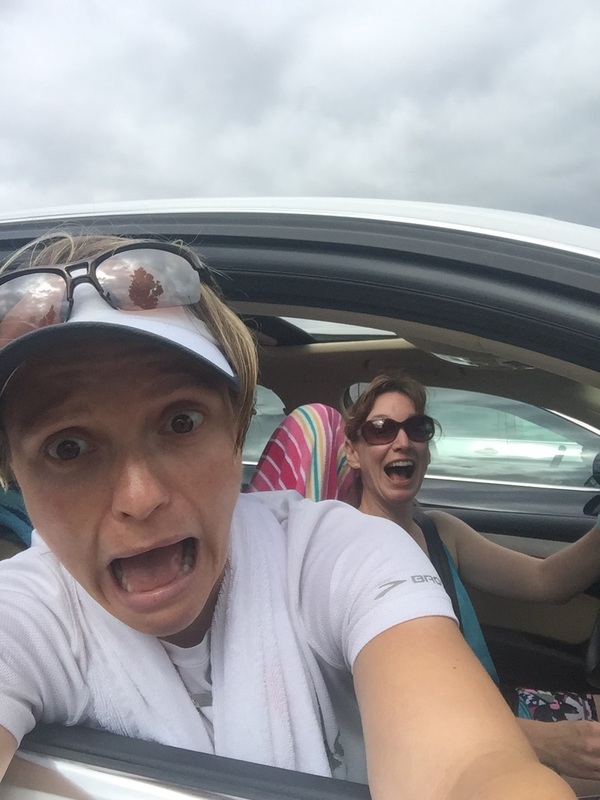 A significant part of training is overcoming the mental hurdles of the tough weeks. You come out exhausted, but stronger on the other side. The next time you look ahead to a week that seems insurmountable, you can look back at previous victories and know that you can make it. Our naive enthusiasm has been replaced with a confident determination. With each additional long run we check off the list, that little voice inside us that says “You CAN do this” grows a little bit louder. I’ve taken my kids to Crockett Park in Brentwood to ride bikes, but I never realized that the trail system was so extensive. 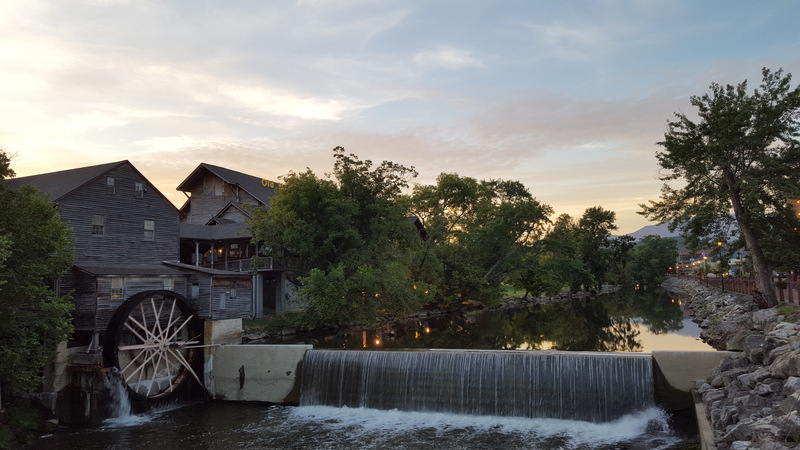 Though a little hilly, the trail was beautiful as it passed alongside a small river, by gorgeous neighborhoods and through a wooded area. I probably would not feel comfortable running alone there (Brentwood is known for its gang activity*), but it was an awesome group run. 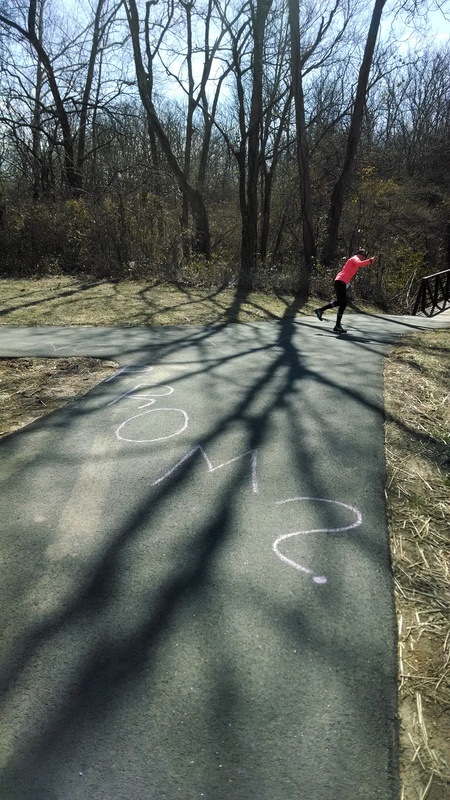 I’d heard that teenagers go “all out” thee days asking their sweethearts to prom, but we saw the adorable evidence of this on our run. As we came to a fork in the trail, a boy had asked a girl to prom with sidewalk chalk, with one direction marked yes and the other marker no. I just hope she chose the path marked yes, just as Abby did as we reinacted the scene. We passed a random couple with a dog that was carrying a sign that said “wide load”. 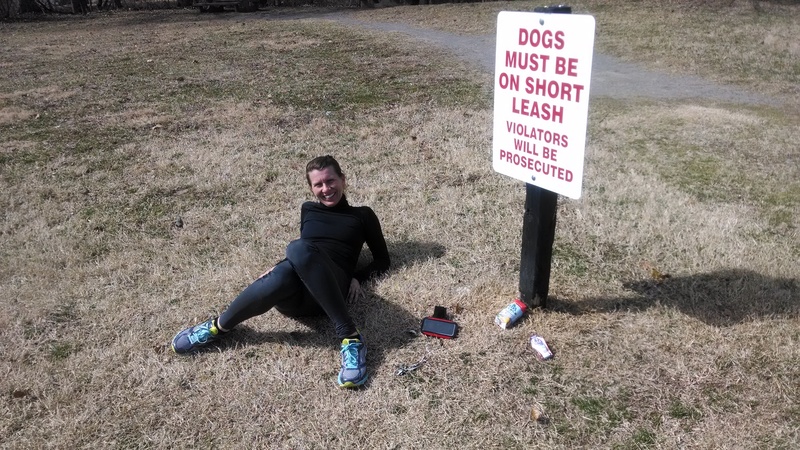 That was our inspiration to keep running, so no one would need a sign like that for us. At about mile 10 Abby got a side stitch. After she failed to get relief with the usual tricks I decided with all my advanced medical learnin’ that perhaps I could “scare away” her side stitch. I know that hiccups are spasms of the diaphragm muscle and we don’t really know what causes side stitches but they are near the diaphragm, so perhaps they could be physiologically related (this was my medical reasoning after running for 2 hours). I randomly just stopped and screamed at Abby and scared the crap out of her. She then she nearly punched me, which could have easily lead to my second assault charge. Luckily there was no violence, only a failed experiment and some minor comic relief. The first 2 hours weren’t bad but by hour three my legs were tired. I figure this is normal. Nothing “hurt” and by nothing I mean pretty much everything ached but I could still move so I assumed I was OK. By hydrating, stretching and making friends with my foam roller on my long run days, I haven’t been too sore afterwards. *Not really. It has the lowest crime rate in the state, but it was a very secluded trail at points. 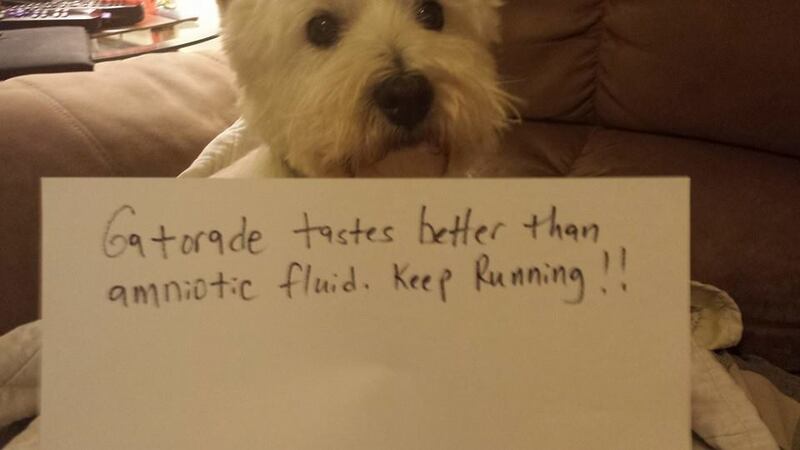 The Marathon is about 6 weeks away. I think if we can survive March, then we should be home free for our April taper. However, that 20 miler is still looming ominously around the corner. 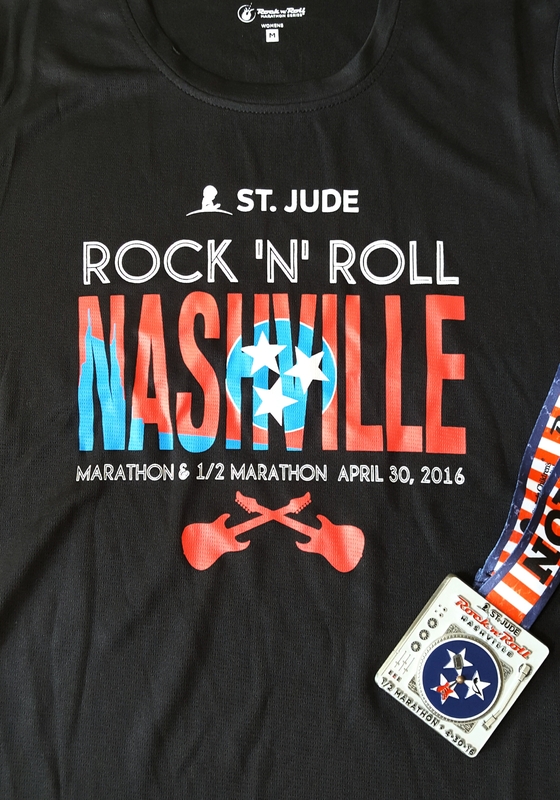 This entry was posted in Running, Uncategorized and tagged country music marathon, marathon training on March 14, 2014 by drrupe.